Ganie FA, Dar GA, Kelam A, Lone H, Dar M, WAni N, et al. Esophageal Tuberculosis Presenting As Dysphagia. Oman Med J 2013 May; 28(3). A 68-year-old male patient presented to outpatient department with complaints of non-progressive dysphagia grade 1 from the last 3 months. There was also history of feverish feeling especially towards evenings. There was no history of cough hemoptysis, dyspnea, melena, odynophagia, hoarseness of voice, or caustic ingestion. Clinical examination was unremarkable except for mild pallor and right subcostal scar from previous cholecystectomy. Baseline hematological, biochemical profile, and urine analysis were unremarkable. Esophagogastroduodenoscopy was performed which revealed a 0.5 × 2 cm punched out ulcer 28-30 cm from the incisor with clean base and overhanging edges. Suspicion of malignancy was high keeping in mind the age of patient and relatively higher incidence of esophageal malignancy in our state. Histopathology of endoscopic biopsy fragments revealed inflamed squamous epithelium and exuberant acute inflammatory exudates in which a few well-defined granulomas and occasional Langhans-type giant cells were seen, (Figs. 1 and 2). Transaxial helical multislice spiral CT scan of chest and abdomen revealed enlarged subcarinal, right paratracheal, aortopulmonary, and azygoesophageal lymh nodes with simple hepatic cysts, and post-cholecystectomy status. A presumptive diagnosis of esophageal tuberculosis was made. The patient was put on standard four-drug anti-tubercular therapy and was followed closely. Repeat EGD was done after 6 weeks revealing no ulcer in esophagus. Dysphagia had settled. There was no fever. Anti-tubercular therapy was continued for 6 months. On followup, the patient was doing well. Figure 1: Low-power view showing chronic inflammatory cells. 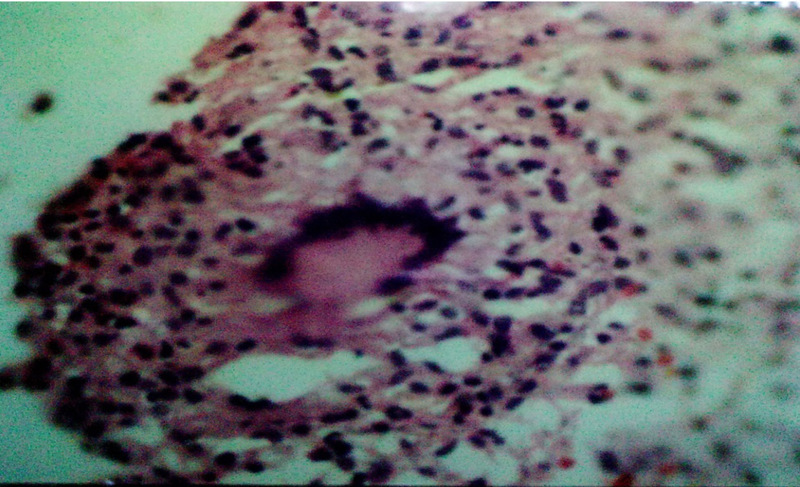 Figure 2: High-power view showing granuloma and giant cell. Esophageal tuberculosis is a rare disease, estimated to account for 0.15%1 of deaths from tuberculosis. Esophageal tuberculosis is of two types, i.e., primary and secondary. Primary esophageal tuberculosis without active extra-esophageal tuberculosis is even more uncommon, and most patients with this condition have underlying mucosal defects, such as Barrett’s esophagitis or esophageal cancer. Esophageal tuberculosis involvement generally affects the middle third of esophagus around the carina. This usually is caused by direct extension and spread from mediastinal structures, inoculation of swallowed sputum, as well as by hematogenous or lymphatic spread. Esophageal tuberculosis has various presentations. Symptoms such as dysphagia and retrosternal pain are most common complaints. Systemic manifestations like low grade fever, anorexia, malaise and weight loss are confused with esophageal malignancy.2-5 Patients may have symptoms indicating involvement of other organ systems. Delay in diagnosis and appropriate therapy might induce severe complications. Paroxysmal postprandial cough or frequent aspiration pneumonia is suggestive of tracheoesophageal fistula. Severe upper gastrointestinal bleed from ulcer and aortoesophageal fistula has also been reported.6,7 Diagnosing esophageal tuberculosis can be difficult, and is usually discovered during surgeries. Esophageal tuberculosis should be suspected in patients with pulmonary or systemic tuberculosis who develop dysphagia and odynophagia. Approximately 50% of cases demonstrate pulmonary involvement on radiography. Mediastinal status, including periesophageal lymph node, esophageal wall thickness, and pulmonary involvement can be further demonstrated by chest CT scans. Upper gastrointestinal endoscopy provides a valuable method of diagnosing esophageal tuberculosis by providing material for both histological and bacteriological examination;8 however, endoscopic biopsy should focus on detecting malignancy rather than excluding it. This is necessary as the two may co-exist.9 Biopsied material should be stained to identify granulomas and acid fast bacilli. In addition, tissue should be sent for PCR-MTB and mycobacterial culture. ELISA testing is 80% sensitive for gastrointestinal tuberculosis.10 Treatment with antitubercular drugs is usually effective; however, if complications such as fistula occurs then surgery, in addition to drug therapy,3,11 is warranted. In conclusion, primary esophageal tuberculosis is rare, and can be difficult to distinguish from malignancy. Chest X-ray, chest CT scan, and esophagogastroduodenoscopy are valuable for evaluating this disease. Surgical intervention may be needed in case complication develops. 1. Carr DT, Spain DM. 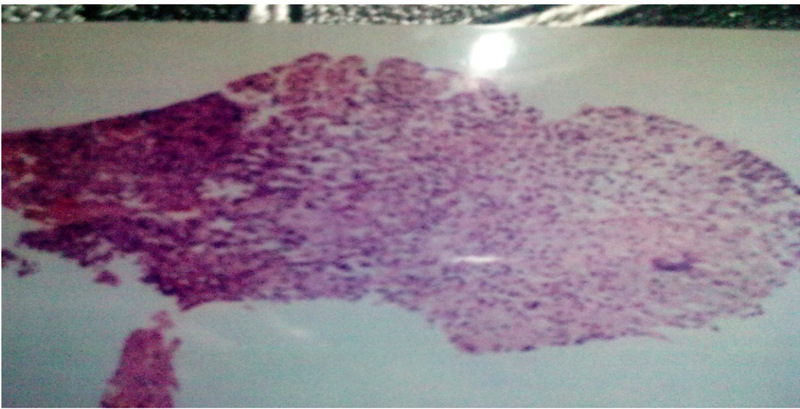 Tuberculosis in a carcinoma of the esophagus. Am Rev Tuberc 1942;46:346-349. 2. Jain SK, Jain S, Jain M, Yaduvanshi A. Esophageal tuberculosis: is it so rare? Report of 12 cases and review of the literature. Am J Gastroenterol 2002 Feb;97(2):287-291. 3. Seivewright N, Feehally J, Wicks AC. Primary tuberculosis of the esophagus. Am J Gastroenterol 1984 Nov;79(11):842-843. 4. Laajam MA. Primary tuberculosis of the esophagus: pseudotumoral presentation. Am J Gastroenterol 1984 Nov;79(11):839-841. 5. Damtew B, Frengley D, Wolinsky E, Spagnuolo PJ. Esophageal tuberculosis: mimicry of gastrointestinal malignancy. Rev Infect Dis 1987 Jan-Feb;9(1):140-146. 6. Robbs JV, Bhoola KD. Aorto-oesophageal fistula complicating tuberculous aortitis. A case report. S Afr Med J 1976 Apr;50(18):702-704. 7. Iwamoto I, Tomita Y, Takasaki M, Mine K, Koga Y, Nabeshima K, et al. Esophagoaortic fistula caused by esophageal tuberculosis: report of a case. Surg Today 1995;25(4):381-384. Jpn J Surg. 8. Abid S, Jafri W, Hamid S, Khan H, Hussainy A. Endoscopic features of esophageal tuberculosis. Gastrointest Endosc 2003 May;57(6):759-762. 9. Yoshikane H, Tsukamoto Y, Niwa Y, Goto H, Hase S, Maruta S, et al. The coexistence of esophageal submucosal tumor and carcinoma. Endoscopy 1995 Jan;27(1):119-123. 10. Anand BS, Schineider FE. El- Zaatari FA. Diagnosis of esophageal tuberculosis by polymerase chain reaction on endoscopic biopsy specimen. Am J Gastroenterol 1994;89:2248-2249. 11. Gray JR, Rabeneck L. Atypical mycobacterial infection of the gastrointestinal tract in AIDS patients. Am J Gastroenterol 1989 Dec;84(12):1521-1524.